JPEG as in .jpg (baseline standard), Uncompressed (Photoshop Level 12) and saved as "Base Line Standard". 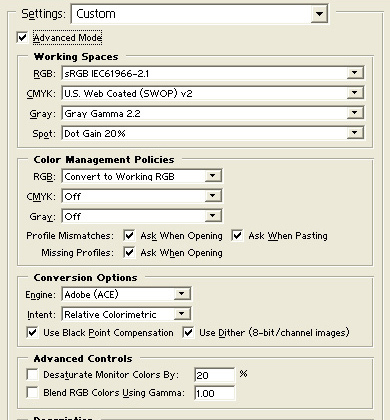 Colour settings: Working space should be "RGB: sRGB iec61966-2.1" and set your colour management policies "RGB: Convert to working RGB"
In the drop down boxes choose the Working spaces as shown on the left. Also we have found that using "Relative Colorametric" as your rendering intent will produce less colour errors and smoother colour transitions than Perceptual, especially in areas of high contrast. Black Point compensation should be experimented with for personal preference. Some clients find having Black Point compensation OFF gives better control over black&white monochrome images. For more precise colour matching, printer profiles can be used for Soft Proofing, prior to printing. PLEASE NOTE: Do Not apply, assign to profile or Convert images to these profiles as the image will become double profiled, over saturated prints.Photoshop Colour Settings must remain as above in the previous step . Make a folder (eg DigitalWorks_Profiles) Click the required profile below and save to that folder. Once installed open Photoshop and load any image.. In the dialog box Click the [ Profile ] Drop down list, then choose the saved file. Ensure that "Preserve Color Numbers" check box is OFF. This will place your Digital Works proof setup in the < View > < Proof Setup > choice list as below. 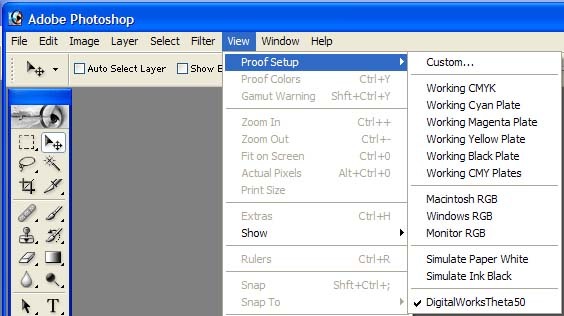 The best way to set your monitor to match Digital Works print output is through using a monitor profiling tool, however these tools can be expensive. NB: To complete this calibration proceedure this printed image is required from Digital Works (Available with this image on CD. $5) You can also use an image previously printed through Digital Works of your own work. We recommend using a typical image(s) (of your own work) and the monitors adjustments to adjust the monitor to your printed image previously printed through Digital Works. Below is the proceedure for setting Adobe Gamma if you do have it. Location: for consistent results, your monitor should have no light or reflections hitting the screen. Light from a window is probably the worst as the colour of daylight changes constantly. LIGHTING: The room should be lit with Phillips TLD 95 fluoro tubes for colour correcting. Allow monitor to warm up for about 20 minutes. Now open the Calibration Image from the CD in photoshop(shown above). 1. Locate ‘Adobe Gamma’ which should be under [start] [settings] [control panel]. NB: Now is a good time to paste a Shortcut to Adobe Gamma onto your desktop. 2. Use Step by Step (Wizard) click NEXT. 2c Follow instructions on this panel for Contrast and Brightness. 2e Uncheck the box ‘View Single Gamma Only’ and, RED GREEN & BLUE boxes should appear with sliders below each. 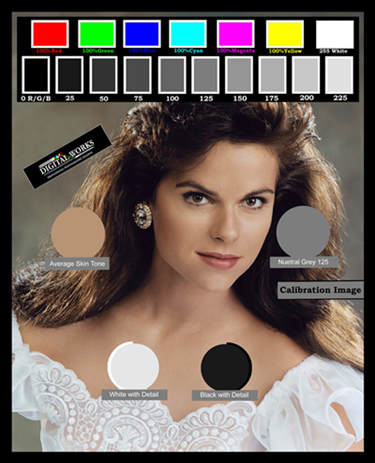 With our Calibration Image on your screen, adjust each colour (if necessary) to match the supplied print. (Click on the slider then use the arrow keys on your keyboard for finer adjustments)The grey scale should end up looking clean, and skin tones should be very close to the supplied image. 2fSet Hardware White Point to 6500 K (daylight) or use measure if not sure. Click SAVE and it’s done. Do any final BRIGHTNESS & CONTRAST changes at the monitor. Now have a break for 5 or 10. Recheck the colour etc of our Calibration Image. If not happy bring up Adobe Gamma again click the ‘Control Panel’ radio button then next and adjust as you see fit. (THIS MAY TAKE SEVERAL TRIES UNTILL YOU ARE COMFORTABLE. Be patient. Will this mean all your prints will match perfectly? …..probably not, ……But you’ll be close.